"Golem is a blend of Frankenstein and Hellboy, laced with a bit of humor and social commentary" says Golem writer Jeff Lee." Golem is definitely a take-no-prisoners kind of character with a black-and-white/Punisher-like attitude toward stomping on evil." Ain't It Cool News says "Golem is another winner from Studio 407"
Golem is described as: When the Balkan conflict tears Sarajevo apart, Srdjan Zivojin, a professor of occult studies, creates a golem of immeasurable power to protect the cities inhabitants from persecution. But the novice magician soon discovers that creating a golem is one thing, but wielding one is another thing altogether. The creature not only has a mind of its own, it intends to crush evil, no matter what the consequences are or the collateral damage that results. Armed with a hair trigger temper, Golem is ready to blaze a path of retribution and destruction. Pre-order now! 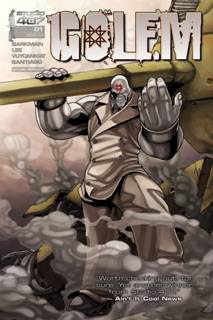 Golem is scheduled to be in stores on January 28, 2009. Full Color 32 pages $3.99 one-shot DCD item # NOV084262. Studio 407 brings together the imagination and creative talents of writers and artists from North America and Asia to generate a flow of distinct and kinetic East-meets-West entertainment. A writer driven studio that blends innovation with tradition, Studio 407 is dedicated to publishing the highest quality in comics and manga, across a wide variety of genres. From capes to kung fu, giant robots to vampires, and secret agents to mad scientists; at Studio 407, we sweat the details.